Call for action on research on how plastics effects the human body. 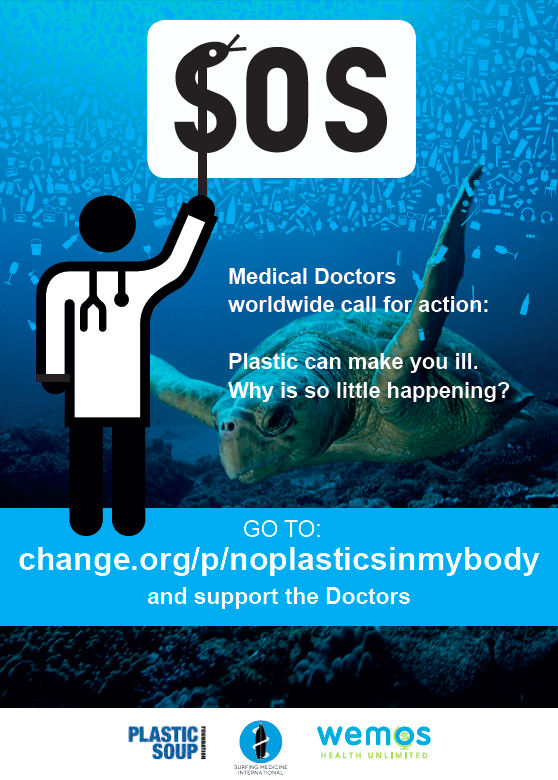 Surfing Medicine International partnered with the Plastic Soup Foundation, and WEMOS to campaign for more research on how plastic effects the human body. On 28 August we ask the attention for research on how plastic effects the human body. • How much plastic is there in our blood and tissues? • Are small plastic particles accumulating in our liver and/or brains? • How do these small plastic particles enter our bodies? through plastic packaging, from wearing synthetic clothing, using cosmetics or through the food chain? Read the the folder with scientific information on noplasticsinmybody here. “A call for the proper action on drowning resuscitation” was published in the August 2016 version of Resuscitation! This is a very important call for all providers, and a chance to update your knowledge on drowning resuscitation. We are proud to present video highlights from our recent Surfing Medicine Conference 2015. Surfing Medicine Conference 2015 from Surfing Medicine International on Vimeo. The Annual Surfing Medicine Conference is a state of the art medical conference delivering premium academic content in an innovative and engaging format. Captured in this video are impressions from the 2015 conference in Biarritz, France. No coastline in sight for 500km, nor surfable Ocean breaks within at least 1,100km. Yet there is still a thriving surf community in the heart of landlocked Europe – surfers riding waves every day in Munich. This is possible owing to a rapid river flowing through the center of the city which is amplified by a steep step in the riverbed and concrete blocks laid beneath. Summer brings the crowds and spectators too! This creates a stationary wave in an urban environment, giving Munich surfers the opportunity to ride 24/7, almost 365 days a year. There is always a rideable wave, with wave faces ranging from waist-to-chest high depending on rainfall, flow, and river levels. The visibility, accessibility, and consistency of the “Eisbach” wave has lead to a steadily increasing number of surfers of all ages and ability riding the break. Inevitably, overcrowding at times becomes an issue and can spoil the experience somewhat, but in this regard the Eisbach is no different to any other surfing break adjacent to an urban area. Munich is one of the epicentres of river surfing and quite possibly the only place in the world were river surfing is happening in the very center of a city. As early as the 1970s people were already riding the wave in the “Englischer Garten”, a large inner city park. Back then, the waves were highly inconsistent and surfing only possible on certain occasions when the water flow was sufficiently strong to create an open wave face. Not until ‘illegal’ modifications were performed by early Eisbach regulars did the wave take on its consistency and power seen nowadays. This involved rather large concrete works on the riverbed and the introduction of a wooden plank, placed in the water just in front of the wave to groom its face. Thanks to these modifications, you can rock up at the wave almost any day and find it working. Surfing this wave feels a little awkward the first time you do it. The water comes from in front of you and rushes underneath your board instead of carrying you along. However, once you’ve got to grips with this, it feels just like wave riding in the ocean. The wave has a couple of bumps and a rippable wall sections so it’s perfectly suited for practicing aerials, hacks, tail slides, and cutbacks times a dozen. The quiver you need here is not exactly that you’d take with for charging big ocean swells. Typically, the boards ridden here have similarities to small wave summer shapes. They are generally higher volume, shorter (5’5″-5’10”), often quite wide, and have flatter rockers with fat squashed or fish tails. Riding the Eisbach can pose some challenges for the uninitiated or unaware. This doesn’t prevent them from testing their luck too many times though! The wooden plank located right at the bottom of the face is covered by only a few cm of water; sizable concrete blocks lurk 30 cm below the surface just behind the wave, right where the washing machine spits you out after a wipeout; underwater turbulence can hold you down for just enough time to unnerve. So, although the wave looks benign judging on size alone, you have to keep your wits about you just as you might at your local reef. Partly because of these dangers, surfing the Eisbach was illegal until 2010. The surfing community which developed around this landlocked wave stands testament to how the act of wave riding can draw people and sustain stoke, even if it’s ‘just a’ river wave. An estimated 800 people regularly surf one of Munich’s stationary waves. There are some smaller, novice friendly, waves in the city as well such as Munich’s oldest river surfing spot, Floßlände. The community comprises everyone from the ‘rip-tear-lacerate’, skate-inspired grommet to the 60+ years drop-knee cutback, trim-glide logger. Numerous surf shops have developed over time. Festivals celebrating all aspects of surf culture, music, art, movies and shaping workshops take place every year. The wave has even peeked the curiosity of high-profile visiting surfers like Rob Machado, Gabriel Medina, Donovan Frankenreiter, and Garrett McNamara. Surfboard companies dedicated to river surfing such as PT Surfboards or Buster Surfboards have had their origin here, starting off by producing shapes especially suited for the Eisbach. But it’s not only the local shapers who manufacture river surfing equipment, Portugal-based Semente and Fatum Surfboards offer specialized designs developed with the input of Eisbach regulars. An official contest scene has not developed around the wave, since surfing here is still only ‘semi-illegal’, but a reasonable number of unofficial jam sessions have taken place. In place of being an official contest venue, the Eisbach has inspired the development of the “European Stationary Wave Riding Championship“, which takes place annually on a completely artificial wave, engineered using the Eisbach as a guiding principle, set-up at Munich airport. So, keeping all this in mind, it’s probably fair enough to say that Munich is the only surf city 600 km away from any ocean! Artificial Waves – The future of surfing? Whilst the Eisbach, as well as other stationary river waves, aren’t necessarily the blueprints for recent developments like Surf Snowdonia or other wave pools/wave gardens, the idea of riding waves removed from the ocean, as has been the case here in Munich for decades, surely fueled the imagination of engineers in developing the artificial wave technology. As competitive surfing progresses increasingly towards professionalization, these stationary waves will provide a uniform, reproducible, and predictable training ground for elite surfers to practice highly technical manoeuvres over-and-over to perfection. In fact they are seen as an integral part of surfing finally becoming an Olympic sport. Regardless of your opinion on the ever present march towards professionalism and concomitant commercialization of surfing, it seems the artificial wave is here to stay, and has the potential to considerably enhance the performance level of surfers from countries traditionally seen as ‘non-surfing’ nations. Getting back to Munich and the Eisbach. Not only is it a practice ground for cutbacks or aerials, it’s also a place to go surfing with friends and be stoked because this feeling is not limited exclusively to surfing ocean waves. No one has a monopoly on stoke, there are many ways to experience it, and for us river wave surfers in Munich, it can be found right in the middle of the city come summer, with crowds, or winter in two degree water and snow on the banks. Till Geimer is a surfer and doctor living in Munich, Germany. He works as a dermatology resident at the Department of Dermatology & Allergology, Ludwig Maximilians University, Munich. He likes to spend as much free time as possible riding waves at his local spot, the Eisbach, or travelling the world in search of good surf. We congratulate Jeremy Flores with two victories on one day. Congratulations on the title in one of the world’s most dangerous waves, in a field filled with talented professionals. Secondly, congratulations on winning the Tahiti Pro while wearing a helmet. This is the beginning of a cultural change that we strive to achieve in the surf sport: keeping the surfer healthy and safe. We will keep informing surfers, so they can make their own decisions on safety issues and injury prevention. Jeremy Flores made a decision to wear a helmet, and immediately got nicknamed “helmet man”. He was informed on the risks by trial and error. He suffered a horrific head injury on the 22nd of June during the Fiji Pro at Cloudbreak this year: two facial fractures, and a contusion in his brain. From our recent research, we learned that surfers who have suffered from an injury, change their safety behaviour. Everyone makes decisions on safety for themselves. Jeremy “the helmet man” Flores already did.